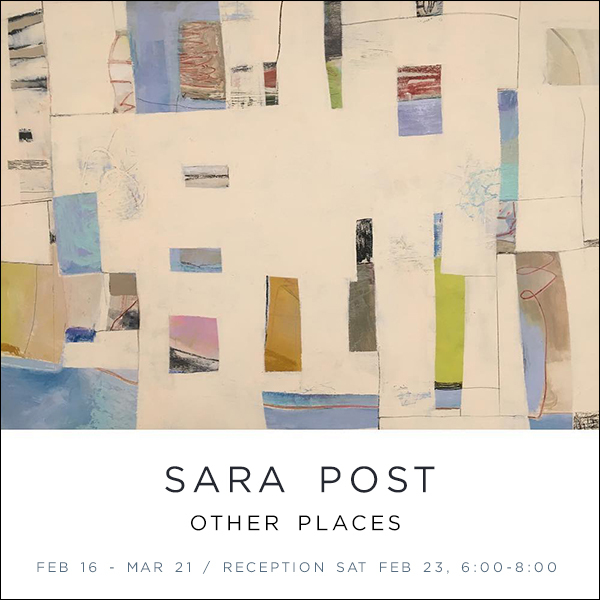 Sara Post, a California abstract artist, began her artistic career as a ceramicist and then moved to printmaking and painting. With the in-depth skill developed from being a lifelong artist, Post’s paintings depict plane and form in rich, abstracted compositions created with impeccable craft. Her confident palettes and broad plane-like compositions are reminiscent of the modernist masters, utilizing both refined line and bold shape to evoke both time and place. This solo exhibition is a culmination of her ongoing investigations of the abstracted landscape and natural surrounding environment. Sara Post, is an American abstract artist, a native of Texas, she has spent her adult life in northern California. Post studied painting at Southern Methodist University and has a Master’s degree in ceramics and art education from Northern Arizona University. She has been a practicing artist since 1981, winning national acclaim for her glaze painted ceramic sculpture, tableware and wall works starting with inclusion in Neiman-Marcus’s ground breaking American Art Forms. Her ceramics have been exhibited In galleries across the US, including the American Craft Museum and the Smithsonian as well as in Canada, Italy and Japan. From 2002-2010 she concentrated on ceramic wall works and installations including the Cold Canyon series for Phoenix Children’s Hospital, nine pieces for Alta Bates in Berkeley, California as well as working with architect Julie Haney on numerous private installations. A printmaking residency in Italy in 2008 changed her perspective on art making and initiated a shift. Branching out, she designed a twenty five piece textile collection for P-B Fabrics in 2012. Experiments with encaustic led to another change: mixing oil paint with cold wax medium. Her award-winning mixed media abstract painting has been exhibited in galleries and museums on both coasts. She is represented by Jen Tough Gallery, Benicia, California and Sparrow in Sacramento, California Her work is also included in the recent book Cold Wax Medium: Techniques, Concepts and Conversations by Rebecca Crowell and Jerry McLaughlin and will be featured in the soon to be released Squeegee Press video series on Cold Wax Medium. She is sponsored by R&F Paints and by Gamblin Oil Paints as a workshop materials representative. Post uses paint or collaged paper layered with wax, to record and communicate experience. “Wax is a transitory medium, light conducting, suggestive of change. I’m intrigued by edges and boundaries—walls, fences, tree lines, shore lines, fault lines—shifting places where change is visibly taking place. Abstraction communicates by suggestion, by feel, allowing a communication that gives preference to emotional response."